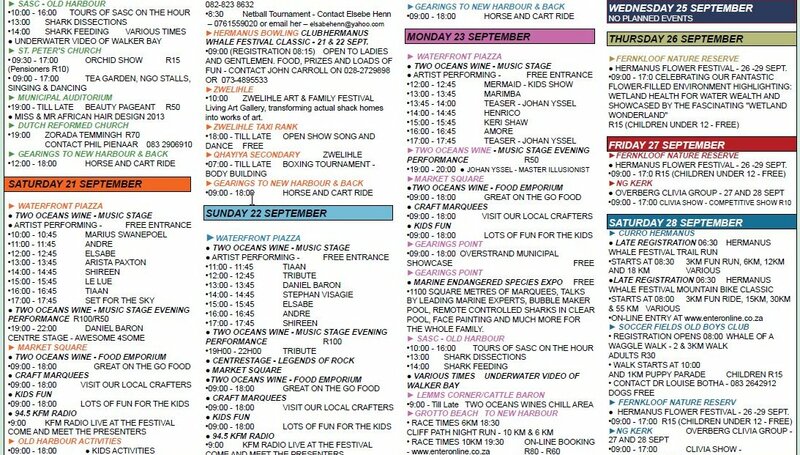 2018 - Hermanus Whale Festival full schedule - TO BE ANNOUNCED soon - 28th to 30th Sept, 2018. 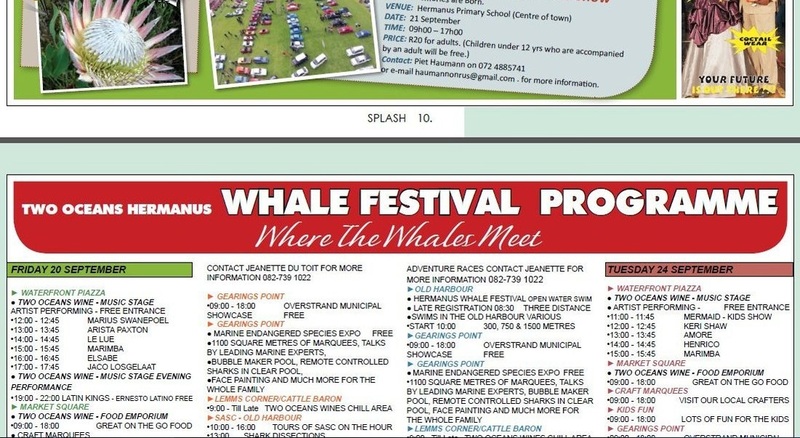 The Hermanus Whale Festival started 25 years ago as an annual community event in the pretty coastal town of Hermanus. Residents and visitors now celebrate the migration of Southern Right Whales (and other marine wildlife) with ocean-themed activities and exhibitions, emphasizing education and environmentally responsible adventures and activities. From the 30th of September till the 2nd of October 2016 the Hermanus Whale Festival will be celebrating as the only Enviro-Arts festival in South Africa, putting the creatures of the deep on stage and under the spotlight, alongside top performers and musicians. The full programme of events will be available on our web-site and from the Festival office. The Whales are always the star performers at the festival and will be joined on land by great food, quality crafters, great sport events, kids entertainment, the Two Oceans Wine food & music Marquee, Marine Endangered Species Expo Marquee, The Checkers Living Table and thousands of people celebrating Spring in the most beautiful place on earth - Hermanus. The 2011 Festival spread its wings to include ten venues around Hermanus and we plan to further extend this in 2012 as well as spreading certain events to the second weekend of the school holidays. Our Market Square crafts, Two Oceans food and entertainment marquee will remain and will be extended to include the Endangered Species Marquee which will be educational and very entertaining with the focus remaining on our marine big 5 and the plight of the Rhino. The Checkers Food Emporium will be housed in a 60m by 40m Marquee with celebrities entertaining visitors throughout the festival. 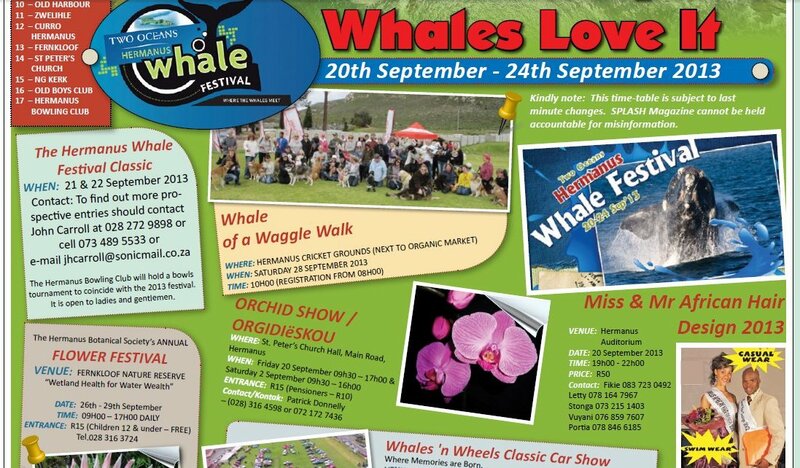 The Whales & Wheels car show will take place on Saturday 6 October. The sports strand will take place throughout the festival as well as the second weekend and will include MTB races, half marathons, and three Old Harbour distance swims. The focus on our beautiful Southern Right whales will continue to be seen in Walker Bay all day long. The variety of events planned will keep the whole family entertained throughout the festival. The full programme of events will be available on our web-site and from the Festival office soon.